Turns out the rumors were true. 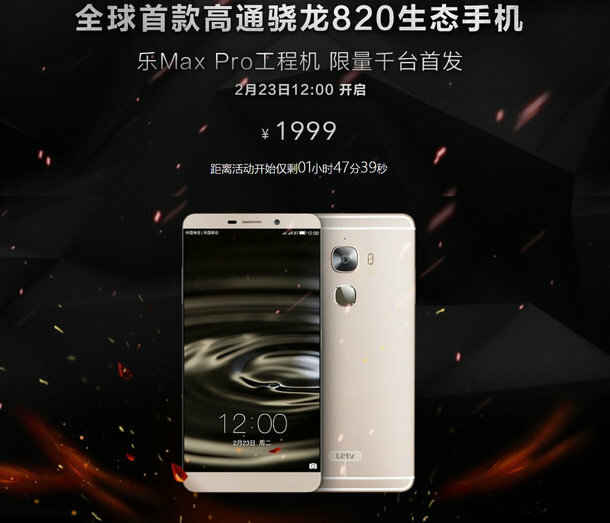 The Le Max Pro from LeEco (formerly LeTV) became the world's first SD820 smartphone to go on sale after a limited number (1,000) of units were made available for purchase today. There are, however, a couple of interesting facts about the sale, which started at 12pm China time. Firstly, the units up for grabs were not commercial models, but engineering models instead. And secondly, they were available for just CNY 1,999 (around $305) - earlier rumors had suggested the device will cost somewhere between CNY 3,500 and CNY 3,700 ($530-$570). Specs-wise, the Le Max Pro sports a 6.33-inch QHD touchscreen, and comes with 4GB RAM, 21 MP rear camera, ultrasonic fingerprint scanner, a USB Type-C port, and 3,400 mAh battery. It runs Android 6.0 Marshmallow.